CADAMSTOWN, or CADMANSTOWN, a parish, in the barony of CARBERY, county of KILDARE, and province of LEINSTER, 6 miles (W. by N.) from Kilcock; containing 1205 inhabitants. It is situated on the road from Kilcock to Kinnegad, and comprises 3637 statute acres, as applotted under the tithe act Balyna House is the seat of It. More O'Ferrall, Esq. The living is a rectory, in the diocese of Kildare, and is annexed to the union of Castle-Carbery; the whole of the tithes, which amount to #118. 8. 10?., are impropriate in the Marquess of Downshire. 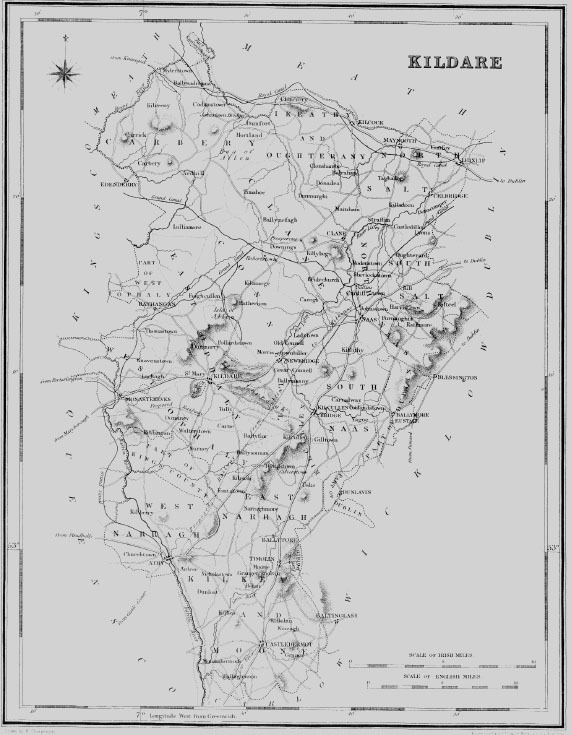 In the R. C. divisions it is the head of a union or district, called Balyna or Johnstown, comprising also the parishes of Mylerstown, Ballynadrimna, Nurney, Kilrenny, and Carrick: there are three chapels in the union, situated respectively at Johnstown-Bridge, Garrisker, and Nurney; the first is a handsome edifice recently erected in the later English style, with a tower and spire of hewn stone. A school at Balyna, chiefly supported by R. M. O'Ferrall, Esq., affords instruction to about 100 boys and 60 girls; and there is a private school, in which are about 20 boys and 20 girls. At Johnstown-Bridge are the ruins of theold church. JOHNSTOWN-BRIDGE, a village, in the parish of CADAMSTOWN, barony of CARBERY, county of KILDARE, and province of LEINSTER, 6? miles (W. by N.) from Kilcock, on the road from Dublin to Tullamore; containing 54 houses and 381 inhabitants. This place, which formerly was of much greater importance than at present, had a patent granted to it for holding a weekly market on Monday, but this privilege has not been enjoyed for many years: fairs are held on March 31st May 29th, Oct. 13th, and Dec. 21st. A constabulary police station has been established, and a dispensary is supported by subscription and Grand Jury presentments. One of the K. C. chapels for the district of Ballyna, or Johnstown, is situated here; it is a handsome edifice, with a tower and spire. In the vicinity are Metcalfe Park, the residence of F. Metcalfe, Esq. ; and Johnstown-bridge, of P. O'Brien, Esq., M. D. There is a curious old cross, the only relic to mark the site of an abbey that formerly existed here.